In NYC last week for lunch, I took advantage of my recently retired status to spend an afternoon appreciating textiles. The Japan Week exhibit at Grand Central Terminal was a bonus. I hadn't expected it. But sometimes, those are the most fun. One popular offering was the guy dressed up as a samurai. 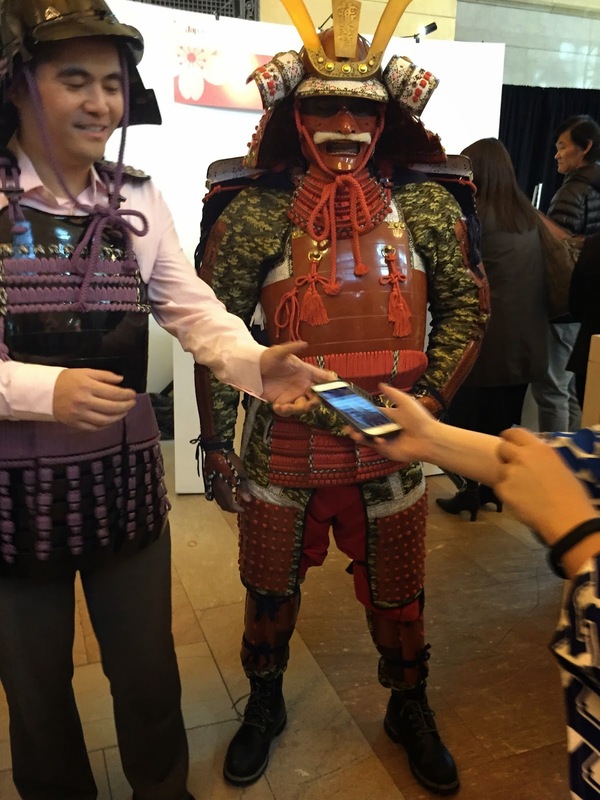 Lots of people wanted to take advantage of the opportunity to dress up in a shorthand edition of the armor and stand for a photo with the fully-attired actor (at right). Lots of braids on both outfits. Traditionally, the suits were tied together with kumihimo braids hand braided of silk by guilds, which guarded their traditions and skills almost to the death of the braiding techniques. Next stop was the Fashion Institute of Technology Museum for a some costuming inspiration. Faking It: Originals, Copies, and Counterfeits, an exhibit of about 100 objects from the museum's collection, explores the world of original designs vs. licensed copies vs. imitations. As one of the museum's video announcers says, 'you can't copyright color or shape' so it's very difficult to prosecute counterfeiters. In many cases, it's very difficult to tell the difference between the original design and a knock-off. And it's getting harder all the time. 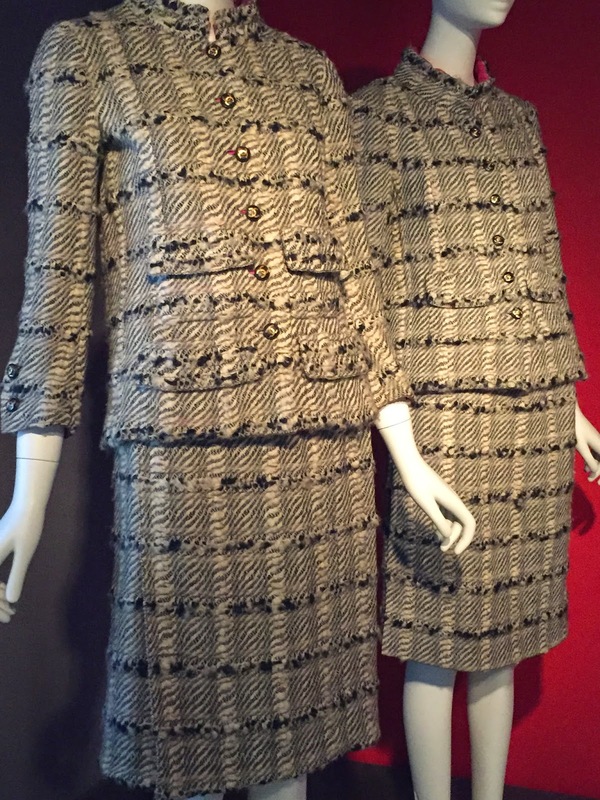 The exhibit's entry features two suits--one a 1966 original day suit by Gabrielle “Coco” Chanel (France), day suit (left) and a licensed copy made in the US in 1967. So what's the difference? According to the information plaque, the differences are in the sewing techniques, the lining and the waistband. Even more interesting to me than the side-by-side originals and copies, was considering the pieces as design possibilities. For example, the late 18th century Jean-Baptiste Huet original L'Hommage de L'Amerique a la France, at right, has a stunning little bolero-type jacket, but check out the free-standing lace on the sleeve's underside seam. 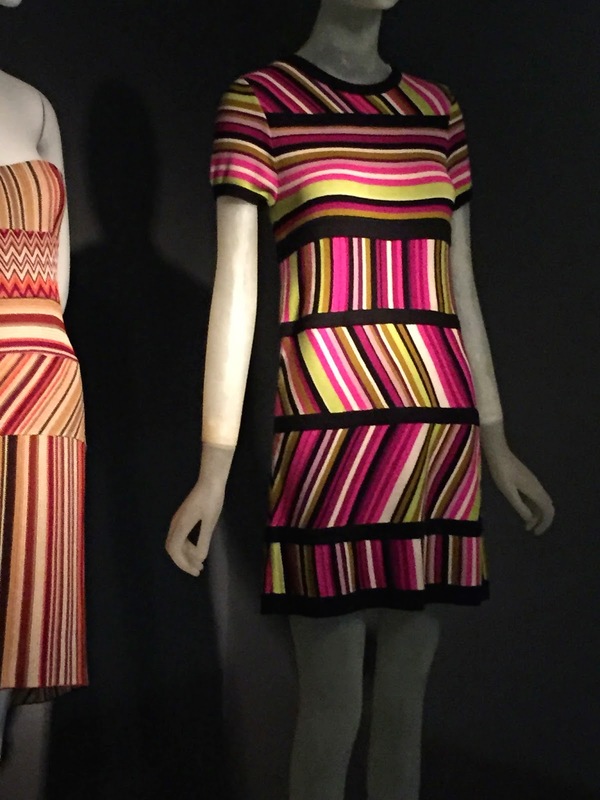 Two Missoni dresses illustrate the 'massclusivity' trend in which high-end designers partner with mass-market retailers to extend their name and styles downstream. 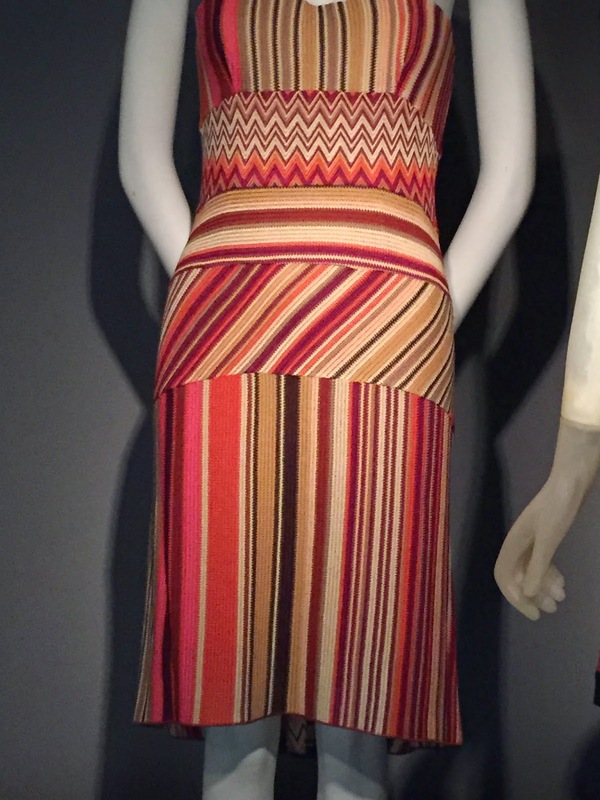 The 2003 Italian-made version is displayed next to a dress that was part of a 400-piece limited edition collaboration between Missoni and Target in 2011. The 'look' is certainly similar, but the fabrics and knitting techniques distinguish the high quality original. 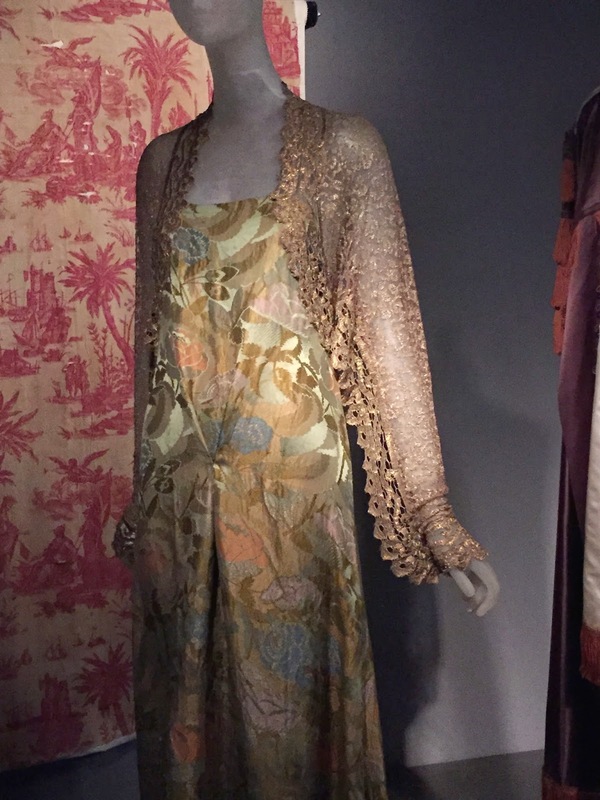 The other exhibit, Yves Saint Laurent + Halston: Fashioning The ’70s, was nostalgic. Their names alone conjures up images of the era's styles. Cleaner, crisper lines, for one. The exhibit focuses on shared themes, one of which was the influence of menswear on women's fashion. Faking It: Originals, Copies, and Counterfeits is on view through April 25, 2015. Yves Saint Laurent + Halston: Fashioning The ’70s is on view through April 18, 2015.